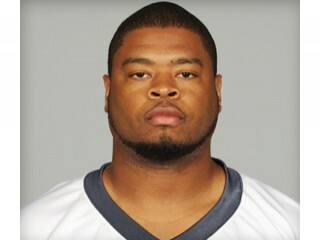 Wade Smith is an American football center/guard for the Houston Texans of the National Football League. Selected by the Miami Dolphins in the third round (78th overall) of the 2003 NFL Draft…Signed by Dolphins on July 28, 2003…Released by Dolphins on September 12, 2006…Signed by the New York Jets on September 15, 2006…Signed by Jets on March 12, 2007…Signed by the Kansas City Chiefs on April 21, 2008…Signed by the Houston Texans on March 16, 2010. Versatile and experienced offensive lineman…played the majority of his snaps with the Kansas City Chiefs (2008-09) at right guard and center…worked primarily at tackle with the New York Jets (2006-07)…former third-round selection of Miami started all 16 games at left tackle for the Dolphins as a rookie in 2003…has played in 74 career games with 34 starts and has played in one postseason contest. 2009 (Kansas City 16/9): Played in all 16 games with nine starts in his second season with the Chiefs. 2008 (Kansas City 15/7): Played in 15 games on special teams and saw duty in 10 contests on offense…started seven games, opening six games at right guard and one at center…was inactive for one contest, vs. Tampa Bay (11/2)...started at right guard vs. New Orleans (11/16) and vs. Buffalo (11/23)...started at right guard and also played at center at Oakland (11/30) and at Denver (12/7)...started at center ivs. San Diego (12/14)...started at right guard vs. Miami (12/21) and at Cincinnati (12/28). 2007 (New York Jets 14/0): Appeared as a reserve in 14 games. 2006 (New York Jets 7/0): Played in seven games as a reserve offensive lineman…saw action in his first game with the Jets vs. New England (9/17)...played as a reserve in the last six games of the season…appeared in an AFC Wild Card Game at New England (1/7/07). 2005 (Miami 0/0): Spent the entire season on injured reserve with a right forearm injury suffered in training camp. 2004 (Miami 6/2): Saw action in six contests with two starts and was inactive for 10 games…started at left tackle vs. Tennessee (9/11) and at Cincinnati (9/19). 2003 (Miami 16/16): Started all 16 games at left tackle…was a consensus all-rookie selection and the club’s Newcomer of the Year by the South Florida media…started his first-career NFL contest at left tackle vs. the N.Y. Jets (9/3). Was a four-year letterman and two-year starter at Memphis…saw action at tight end his first two seasons before switching to tackle as a junior…played in 45 games (29 starts)...started all 12 games at left tackle as a senior in 2002…named second-team All-Conference USA…opened all 11 games at right tackle his junior campaign in 2001…named the team’s Offensive Lineman of the Year…played in 11 games (five starts) as a sophomore in 2000…caught five passes for 25 yards…saw duty in 11 games (one start) as a true freshman in 1999…had one catch for six yards…graduated from Memphis with a degree in finance. Was a two-year letterman as a tight end at Lake Highlands High School in Dallas…is married to wife, Chareta, with a son, Nicholas, and two daughters, Arissa and Aalyiah. View the full website biography of Wade Smith.